If you could reboot Western Australia and install an upgrade, what features would you like to see? This is the question being asked by Greens Senator Scott Ludlam, who is aiming at being reelected for a second term at this Federal election. 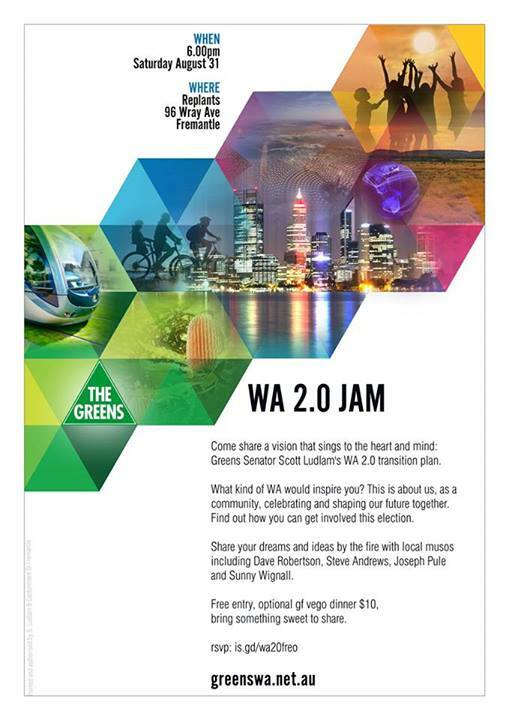 WA 2.0 is his vision, including fully costed plans, for a better, sustainable Western Australia. This is such a positive, wonderful vision for our state and I urge everyone to take a look. In contrast to the negative politics and pork-barrelling spend-a-thons that I hear people complaining about, this is the sort of thing we should be expecting – or demanding – from politics. This Saturday at Replants, there will be a workshop showcasing Scott’s the plan, asking our community to share in a positive vision for Western Australia and exploring how we can take some responsibility for making this change. After the workshop, a few local bands will be performing (including the first gig for the band I’ve been playing in!) and then everyone is invited to hang by the Replants fire to jam songs and ideas. If you want to attend the workshop, there is food available for $10 and you;re asked to bring something sweet to share. I don’t think I’m the only one on Wray Avenue who has been really disappointed in Melissa Parke over her support for the Government’s plan on asylum seekers (and yes, I’m sure there are some who think her position is fine, and other who think it doesn’t go far enough). I have had a few people ask me if there is anything happening on Wray Avenue outside Melissa Parke’s office. It has happened before and looks like it is happening again. “Thursday, 15 August, at 4 pm join us in front of Melissa Parke’s Fremantle office to demonstrate community opposition to the PNG “solution” and Ms Parkes’ support for abandonment of the refugee convention. We will be delivering copies of petitions we have been gathering signatures on opposing the off shore processing of asylum seekers. The action will be held at Ms Parke’s office, 62 Wray Avenue, Fremantle. There was a protest organised a few years back which went really well (which I wrote about here). Quite aside from my personal beliefs about how we, as a society, should respond to asylum seekers, to me there is a bigger issue here. For me, the issue with the Government’s plan, and my problem with Melissa Parke’s support for it, is a failure to show integrity in upholding, both in practice and in spirit, a international convention our nation helped to draft and sign into law. Our signing the Convention on the Rights of the Refugee is a truly noble gesture that we should celebrate as a great act, not look to modify or ‘reimagine’ to suit political ends. Much of the debate I’ve seen and read seems to suggests the Government’s plan may not even be legally defensible; I’m not a lawyer though, much less one experienced in international law. Fremantle is the only real politically-left Federal seat in Western Australia and I think it’s constituents deserve better – especially since they are often promised better by candidates, incumbent or otherwise. Despite Ms Parke’s reasonable defence of her position recently in The Fremantle Herald, I’m not convinced she is right and plan to add my voice of protest on Thursday. My football (soccer) team played a rare night game last week, rescheduled because of Mother’s Day. It was a derby between my side, East Fremantle SC, and Fremantle United, clearly a bigger event than the Western Derby on the following weekend. I didn’t see many folk venturing out to Bruce Lee Reserve on the cold evening, probably confused by the fixture change. For me though the rivalry intensified when I saw another Wray Avenue personality on the field, none other than Josh Wilson, Fremantle Deputy Mayor and Fremantle councillor, who works at Melissa Parke‘s office and who was once tipped to be the Fremantle Labor candidate at the next state election. He was a savvy midfield player wearing number 12, and I found myself playing against him on several occasions. My side ended up winning 5-2, proving that there’s only one team in Fremantle! I look forward to the reverse fixture and might take some photos. Oddly, I don’t think I’ve ever mentioned that Fremantle’s Federal MP, Melissa Parke, has her offices on Wray Avenue. Anyone on Wray Avenue yesterday between 4pm and 6pm who did not know this would have become swiftly aware of it. When I was dropped home from work on Friday, there was a large crowd of activists out the front of her office protesting against the Federal Government’s planned Malaysian Solution. 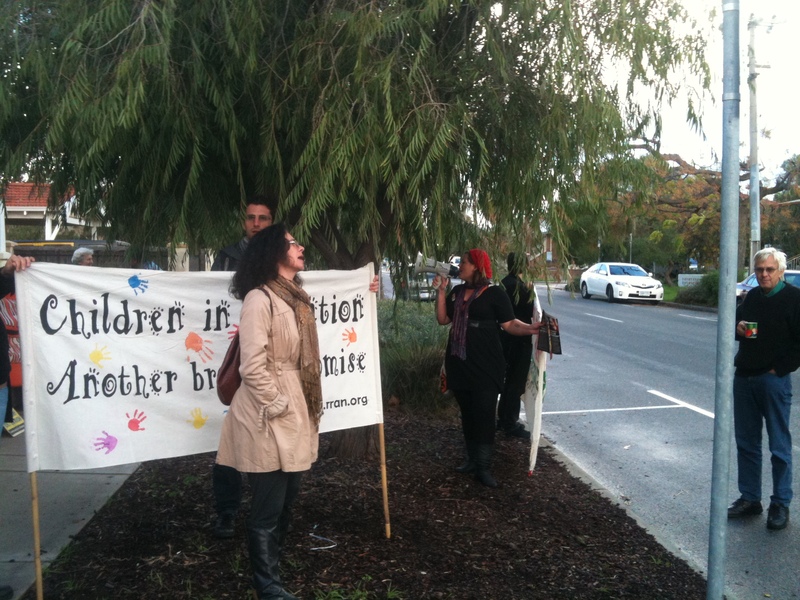 There were members of RRANWA, Socialist Alliance, Socialist Alternative and some locals holding banners and signs calling for Melissa Parke to officially oppose the government’s approach to asylum seekers. Wray Avenue had become a site for a coordinated political protest. Melissa Parke is frequently reported in the media, both locally and nationally, as being a progressive voice in the Federal Government on the issue of asylum seekers. She is steadfastly opposed to any policy that violates the UNHCR and results in harm for children. That said, there is no indication that she would go further and publicly endorse a more humane solution beyond this minimum standard and no indication that she would be willing to cross the floor in parliament and vote against legislation aimed at being “tough on refugees”. There are reports here and here that Parke was involved in trying to put up a motion for WA Labor to oppose (before the motion was shut down) at the recent state conference which was attended by the PM. It’s note-worthy that several WA State MPs, from right and left factions, have voiced strong disapprovals against the Malaysian Solution. Disappointing then that they weren’t able to debate it. I’ve previously alluded to the booth at Fremantle Primary School behind Wray Avenue having one of the greenest votes in the state; it is undoubtedly a major progressive, left-leaning booth both state and federally. I think that those who voted for Melissa Parke, an excellent candidate with strong social justice and human rights credentials, expected progressive values on issues like asylum seekers to have greater representation in this government. I also think that these views, while not unanimously held, would certainly be endorsed by the majority around the Wray Avenue precinct. A few people, particularly older residents, did come out the front of their houses and looked perturbed by the disturbance, but I think this was more a reflection that this was unusual for this area rather than an opposition to the point of the protest. 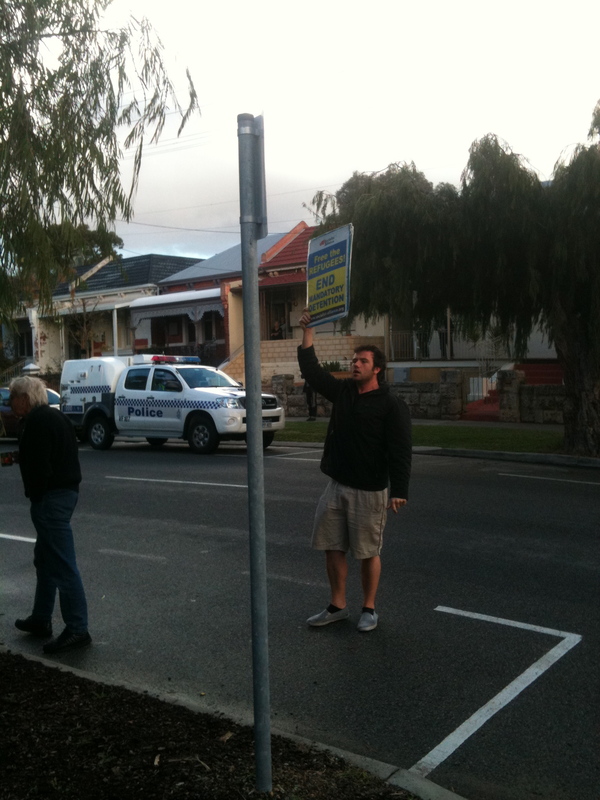 Plenty of cars – and a couple of bus loads of commuters – drove past signalling support anyway. “… I applaud the WA Labor MPs for their public opposition but I sadly doubt that this will translate to action on the floor of parliament. The ALP retain only three seats in Western Australia. Fremantle, one of these, is a prize seat having been held by Prime Minister Curtin. Sadly, I think that it is taken for granted as a safe seat by the party at the federal level and the type of Labor people here expect and want isn’t forthcoming. The same thing happened not too long ago with the “safe” state seat of Fremantle, and most people would know what happened then. 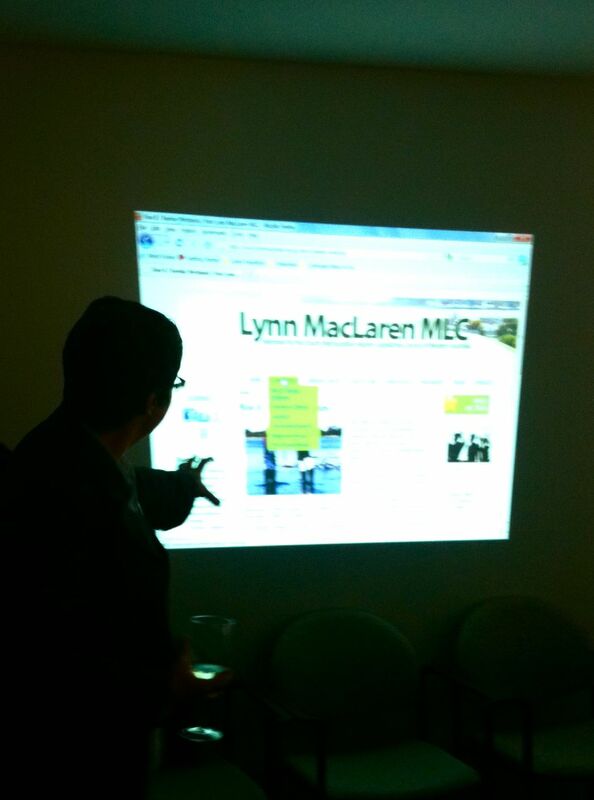 I had the pleasure of attending South Metro MLC Lynn MacLaren’s sundowner today to celebrate the launch of her new website. I see it as a good thing that her office is in the Fiveways here on Wray Avenue within 300 metres of one of the greenest polling booths in Western Australia. It’s further evidence that this community is embracing the progressive values I want to live amongst.